Check out our full review of the Sony Vaio Duo 11 laptop. With the success of Asus’s Transformer tablets and Microsoft requiring touchscreens on new Windows 8 PCs, every laptop and tablet manufacturer is going crazy trying to reinvent the wheel. Regular tablets and regular laptops are too boring in this Windows 8 universe. There are at least two dozen Windows 8 devices launching at the end of October. To get attention, you need a gimmick. Sony’s big idea, like Toshiba’s, is a tablet with a slide out, and up, keyboard. Sony is calling the Vaio Duo 11 a “slider hybrid.” It has the touch capabilities you’d find in a tablet like the iPad, but runs on a processor and other hardware you’d find in a traditional Windows laptop. Sony hopes the Duo 11 will hit a sweet spot and be a best of both worlds scenario. I’m not as optimistic. I love the idea of a slide-out keyboard, and am a fan of Toshiba’s U925t (though I’m not a fan of its name), but Sony’s design did not impress me. The Duo 11 will start at $1,100, a high price for a Windows PC these days, so for that price, I kind of expected everything to work fairly well. Unfortunately, like some other recent Sony products, the big problems I had were manufacturing and design issues. Figuring out how to open the Vaio Duo 11 was my first challenge. Though it slides out, you cannot just slide the screen forward (and up). Instead, you must pry the back apart. Unlike a MacBook, getting the Vaio to open is reminiscent of prying open a bear trap. I needed both hands. Once slide out, the screen sits at 1 unadjustable angle. It didn’t bother me much, but I missed the ability to adjust the angle of my screen. More of a problem was how floaty the screen was. It doesn’t snap into place very well, and often just kind of hovers near your keyboard. One of the rubber feet on the unit I was using also came off. Hopefully that’s not a common problem. The other annoying issue I had was that if the screen happens to be oriented upside down or vertically when you slide out the screen (which happens since this is also a tablet), it will not auto correct itself. You can get the screen to face upward if you lift the entire screen (and device) toward you, but in its default resting position, it will not auto right itself. I encountered this problem multiple times in my few minutes with the Duo 11. It’s hard to believe no one at Sony has discovered and fixed the issue. Perhaps it’s a Windows 8 problem? Either way, it’s not wise to make a device that doesn’t know up from down. Finally, at 2.87 pounds, the Duo 11 was a little too heavy to effectively use as a tablet. It’s hard to complain too much about this since it doesn’t have to be used as a tablet, but Sony is really touting its flexibility. Minor gripe. Though its more tablet now than laptop, there is still good in the Duo 11. Windows 8 ran quite smoothly on the hybrid and I had no issues with the 11.6-inch touchscreen or the keyboard. Sony has actually included one of those old keyboard nubs you’d find in Lenovo computers so you can have a mouse pointer without a hassle. The Duo 11 runs on a 3rd-generation Intel Core i3 processor, has a full 1080p screen, comes with a 128GB solid-state drive (flash storage), has 4GB of RAM, does not have an optical drive. Unfortunately, it does only get about 4 hours and 45 minutes of battery life, according to Sony, which is less than many thin laptops these days, which can often achieve 7 hours before a charge. 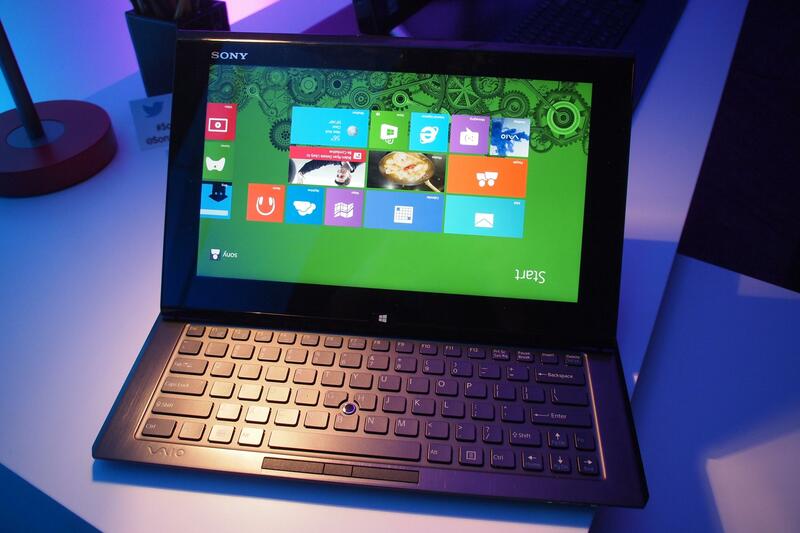 Overall, I didn’t walk away impressed in my first encounter with Sony’s new convertible laptop. There are a lot of solid Windows 8 devices coming out. I’m not sure this is one of them. Can Best Buy beat Amazon at its own game with price matching?